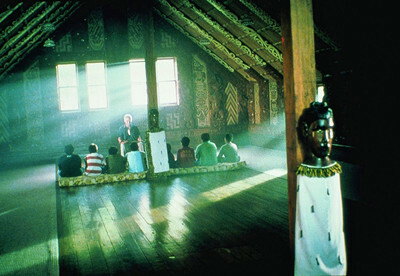 While Whale Rider does have a few bold artistic moments that make a splash in its cinematography, most of Niki Caro's film focus on the natural, raw beauty of the New Zealand coastline, the ornate wood ambience of their tribal gathering spot, and nuanced close-ups during conversations and tribal dances. Shout Factory's transfer, which looks to come from the same or a similar source as Buena Vista's Australian release from a few years back, fluctuates between dazzling beauty and being anchored by digital issues. Daytime sequences project lush, beautiful greens and crisp blues through a faintly tan-leaning palette, making those shades appear somewhat warm yet appropriate with the rest of the image, but there's a distinct lack of filmic texture to many of them, resulting in some flatness. Darker sequences routinely preserve all the details within, even complex sequences on the beach, but they also emphasize a lot of heavy grain and compression issues. Ornate details in carvings, makeup, and garments are frequently well-etched and digitally sound, but there's also some digitally messy contours and some aliasing along a few rooftops. 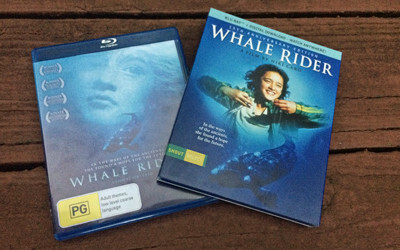 The beauty, especially the underwater whale sequences, vastly outclass the handful of problems, resulting in a flawed but ultimately satisfying transfer for Whale Rider. Very little to complain about with the DTS-HD Master Audio track, though, encompassed in a 5.1 DTS-HD Master Audio track whose strength, crispness, and lower-end response seems like it's taken a step above prior sound presentations of Whale Rider. The gorgeous, energetic soundtrack commands a hefty and well-balanced presence across the surround stage, responsible for the bulk of the rear-channel activity. Back-end response isn't in terribly high supply, adding little ambience during rushing waves or tribal performances, mostly containing the activity to the front channels. The clarity that comes from the core of the track is superb, though, potently delivery every nuance of New Zealand-accented dialogue with razor-sharp precision, delightful midrange tempo, and a wonderful grasp on the echoes of the environment, while the crack of staves against one another and the splashing of waves embraces sharp high-end response. Whale Rider sound phenomenal. Optional English subs are available. Shout Factory remain diligent in their effort to gather together as many applicable extras as possible for their releases. That wasn't much of a chore this time around, as this 15th Anniversary Blu-ray merely duplicates the prior extras -- beat-for-beat from the DVD release and Australia's Blu-ray -- without anything new added on. 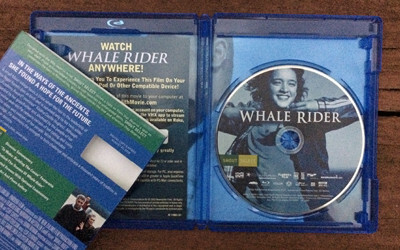 In a way, that's both good and bad, as Niki Caro's illuminating, yet gently-paced Audio Commentary and the nearly half-hour featurette Behind-the-Scenes of Whale Rider (27:02, 16x9) service the film well. Director Caro's commentary largely strays from narrating the plot and focuses on the craftsmanship involved, offering anecdotes about the culture, the filming process, and Keisha Castle-Hughes. The behind-the-scenes extras certainly possesses a vintage, press-kit feel to its narration clip structure, but the interviews with Niki Caro, the producers, and the cast robustly cover the original novel, the main actors and their respective roles, and blending "the natural with the supernatural". A few other extras have also emerged from Shout Factory, including Building the Canoe (11:15, 4x3 Letterbox), which chronicles the production aspects of building the ceremonial vessel, a series of eight Deleted Scenes With Optional Commentary (8:33, 4x3 Letterbox), a Keisha Castle-Hughes Screen Test (6:11, 16x9 HD). and an in-motion Photo and Art Gallery (1:57, HD). Rounding things out are a Theatrical Trailer (2:57, 16x9 HD) and a few TV Spots (2:37, 4x3 HD). Admittedly, it's a bit disappointing to not have a retrospective with Keisha Castle-Hughes and/or Niki Caro included on this anniversary Blu-ray release, especially given Shout Factory's reputation for doing so, but the supplements available are entirely satisfying. 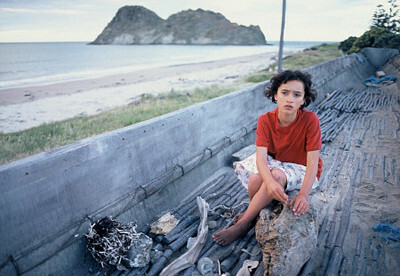 Whale Rider made waves when it was released a decade and a half ago, and the beauty of its craftsmanship and the strength of its messages remain just as poignant and dynamic in the current era ... if not more so. Embedded within Paikea's trials toward becoming a Maori leader amid a male-dominated culture lies a beautifully interwoven blend of heritage, supernatural belief, and female empowerment, commanded by the effortlessly captivating essence of Maori tradition and by Keisha Castle-Hughes' versatile, poignant turn as Paikea. Here's hoping that the popularity of this New Zealand gem will continue to grow in response to similarly invigorating stories that have been recently released. Shot Factory's Select release boasts familiar, yet strong audiovisual properties and extras, making this a Highly Recommended package for a tremendous film.